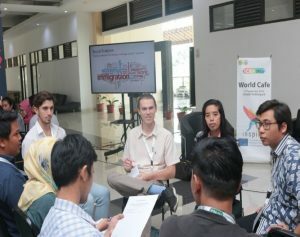 Based on a variety of social entrepreneurship sectors and activities, the Undergraduate and Postgraduate Studies Program in Business Administration of Parahyangan Catholic University in collaboration with the Regional Government of Cimahi City organized the International Conference of Business Administration in 2018 (ICBA 2018). 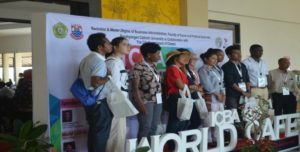 To provide more synergy with the conference, International Office of UNPAR also organized a world cafe of social entrepreneurship. 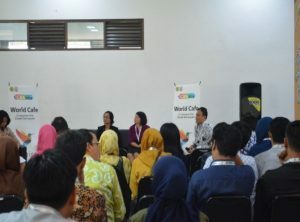 The world cafe event was simultaneously conducted at the first floor, in the co-working space for business incubation of Cimahi Technopark. 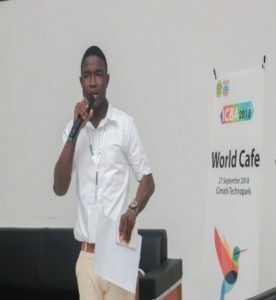 The aim of the world café is to discuss, disseminate and facilitate students who want to explore and envolve in the world of socio entrepreneurship. This event was steered by Mr. Elivas Simatupang (Regional Development Planning Board of Cimahi City) and Ms. Fiona Ekaristi (Faculty member of Business Administration Department of UNPAR), accompanied by Mrs. Ratih Indraswari (International Office of UNPAR), Mrs. Tutik Rachmawati (Faculty member of Public Administration Department of UNPAR) and Mrs. Maria Widyarini (Head of MBA Program of UNPAR). 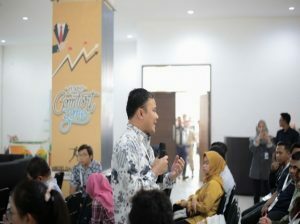 At this event Mr. Simatupang presented an introduction of the concept of social entrepreneurship. To be more local and relevant to Indonesia context, he presented two case studies of developing previously discriminated communities in Cimahi Municipality. As part of excercise participants were then divided into several working groups following five steps of making an SE business model namely semphatize, define, ideate, prototype and test (Vial, 2018).